March -Alice and Her Sisters with and by Eva Buchmüller, Marianne Kollár and Anna Koós and István Bálint. Location: Dohány-utca 20. In two rooms. Performed until the summer. 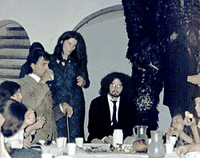 Tribute to Miron Bialoszewski with Péter Halász, Péter Breznyik and Anna Koós. At the Polish Cultural Center in Budapest. Writer/translator Grácia Kerényi invites the group to simultaneously perform and read from Miron Bialoszewski's poems and texts of his plays originally performed in his Warsaw apartment between 1953 and 1960. May- Breznyik and a Woman ..A six-hour solo by Péter Breznyik. Location: Dohany-utca 20. Objects cram the room. He performs rituals: self-sacrifice (he cuts his vein and drinks a few drops of his blood), self-castration (he uses false genitalia), etc. Dressed as a Russian soldier and wearing a mask he reads aloud from a classical Russian novel. live music in the bell tower (photo above) György Kurtág, Jr. Birds and Red Epaulets. A daytime improvisation. Live statues are situated along the chapel perimeter: Éva Buchmüller sings a Jewish song sitting like the Virgin Mary holding a young man (Can Togay) on her lap, in the position of Michelangelo's Pieta. A mother (Anna Koós) sings a partisan song to her baby (Galus Halász). A man (István Bálint) in his briefs lies on his back in a fetal position, while another man (Péter Halász) dressed only on his left side while his right side is naked, flies around him like a bird. Spectators sit, stand or walk around. The Chemistry Engineer and the Construction Manager. Happening by László Algol. On a patch of grass near the Chapel. From 6 PM until 9 AM. Individual mythology with pop music and fire. King Kong -a three-day performance. King Kong's body made by Péter Donáth. Its hair covering the body was woven by the women in the group. Players: Sándor Simon (King Kong's head), Péter Halász (King Kong's talking phallus), Péter Breznyik (the Beautiful Lady of New York), Éva Buchmüller, Emő Dobos, Marianne Kollár and Anna Koós (ladies in waiting), László Algol, Miklós Kovács and István Bálint (King Kong's detractors) and Can Togay (dwarf). Texts: the dwarf's invective was written by Balint; text of King Kong's phallus: selected lines from Proverbs of Hell and "A Song of Liberty" in The Marriage of Heaven and Hell by William Blake. Women's prayer: Psalms by Thomas Kempis. Planned by István Bálint, Péter Breznyik and Péter Halaáz. Live music on Japanese gong and electric guitar by György Kurtág, Jr. Recorded music: slow speed recording of an Amazonian wood quail. October- Unofficial performances during the Open Theater Festival in Wroclaw, Poland. An improvisation by Can Togay, Eva Buchmüller, Marianne Kollár, György Kurtág, Jr., Judit Scherter, Péter Breznyik, István Bálint, Péter Halász and Anna Koós with her daughter, Galus Halász. During their stay in Wroclaw, the group stays in the small home of Teo Spychalski, dramaturg and Elisabeth Albahaca, actress, at the Teatr Laboratorium. As a consequence of the Wroclav performance the passports of Péter Halász, Anna Koós and Péter Breznyik are withdrawn and an official sanction forbids them to leave the country until the end of 1977. The Perfect Prothesis or the Beggars of the Day by Péter Breznyik and Anna Koós. Location: Dohany-utca 20. A beggar, with a growth over one eye, and his companion sit on a high bench in front of a closed door. Spectators stand in the long unheated apartment corridor. The beggar reads a newspaper article aloud, then plays a tune on his accordion. The article praises a particular worker who has lost his arm in a workplace accident. His arm has since been replaced by a prothesis. Despite his condition the worker has the highest production record in the factory. Once the beggar has finished the article, his companion walks around with a hat. King Kong ( two days performance in Dohány-utca 20). Variations of the play refer to the actual season: King Kong with Autumn Flowers, Last Supper King Kong and Christmas King Kong. On several occasions women friends offer drops of blood to the Beautiful Lady (Péter Breznyik). The police often attempt to interrupt the performance but never present an official warrant. On the picture: the Beautiful Lady teases King Kong. Phallus (Péter Halász). November -Birds and Red Epaulets. A variation of the performance developed in the Chapel at Balatonboglar in Dohany-utca 20 the half-blind beggar (Péter Breznyik) reading the newspaper article about the perfect prothesis with (Péter Halász) dressed only on his left side while his right side is naked, (photo below).